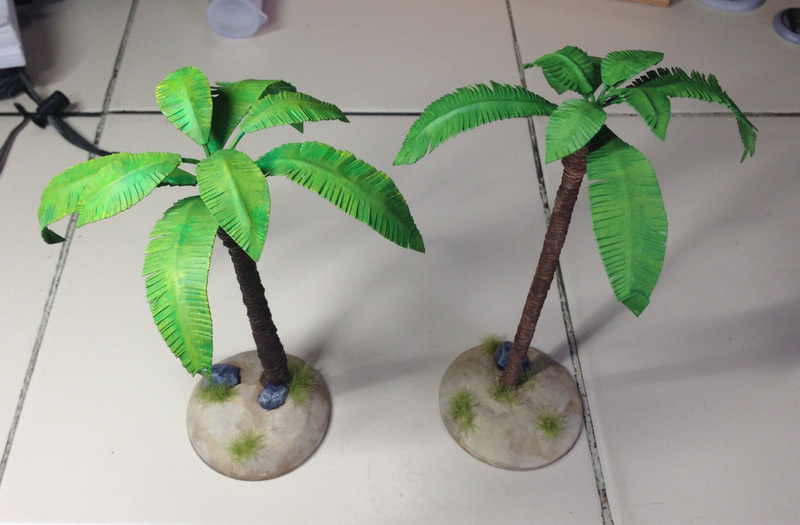 Well, I finished the two palm tree scatter pieces. I think they turned out well. So, once again, it’s been a while since I’ve posted anything here, but I have been busy behind the scenes. I continue to work at my sculpting skills. I added three miniatures to the store that I finished about 2 years ago and just never put up for sale. They available now over at the Moonlightmini store. They have a bit to go yet, but they are getting there. And they will have friends!!! Well, I made it to day 2. 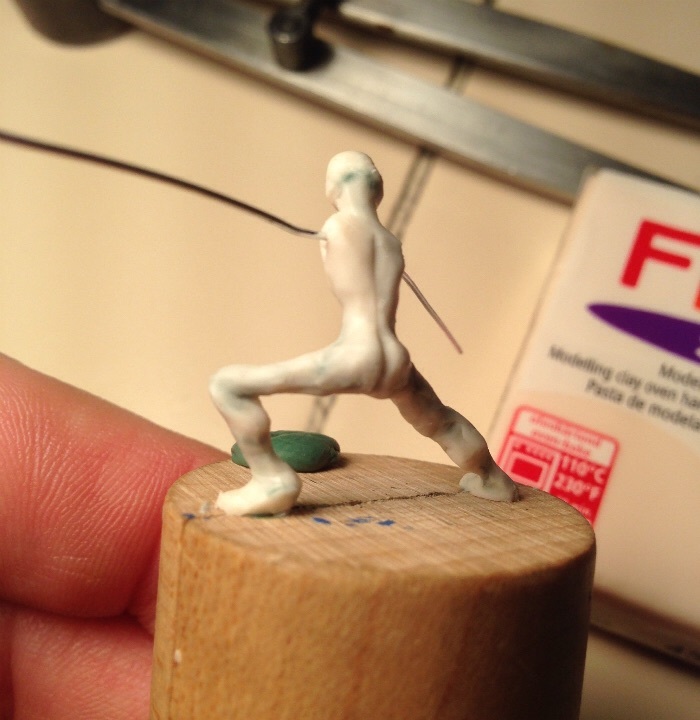 I continued bulking out the base armature clay focusing on the lower half of the figure. The first mini is a little rough still but the second is coming along well. 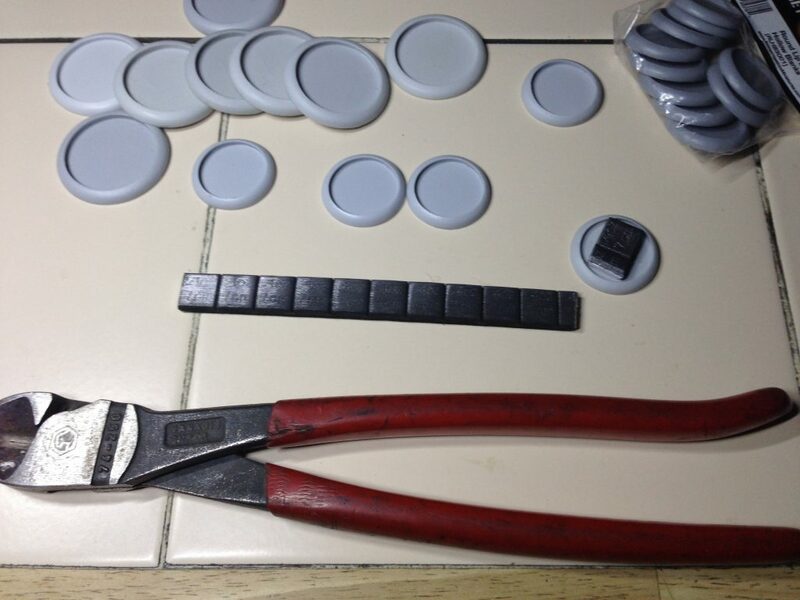 All the work was done with Fimo using metal tools and clay shapers (color shapers). The final smoothing was done with a paint brush. Total sculpting time was about 1 1/2 hours. I know! I’m slow! My son is interested in playing Frostgrave. 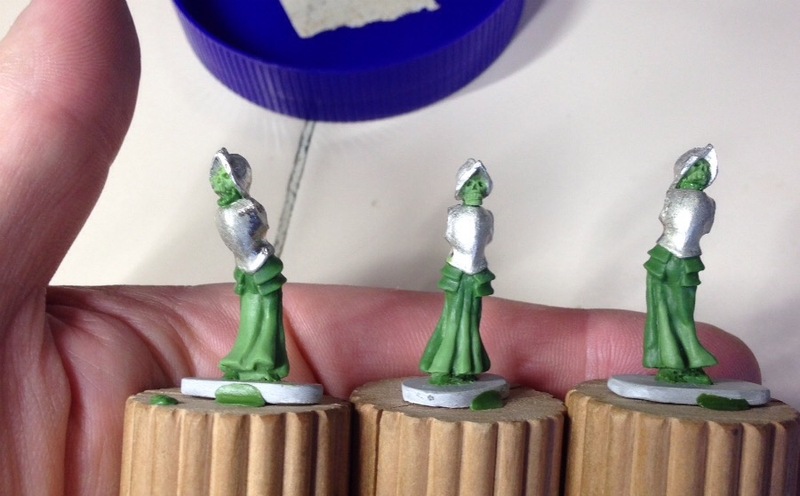 With that in mind, we have been working, when time allows, on miniatures for the Frozen City. My addition to the horde is a frost worm. 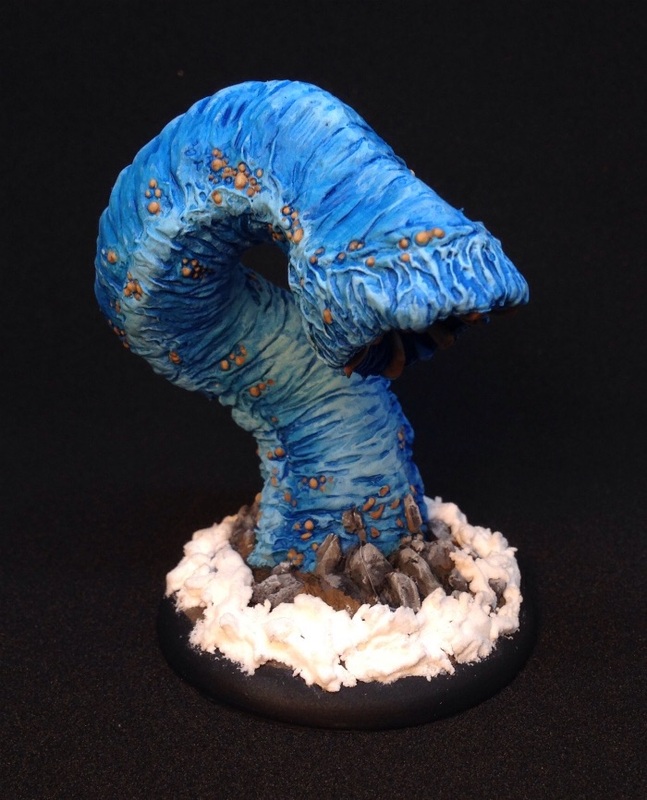 The frost worm is Reaper Miniatures Great Worm (#77006). 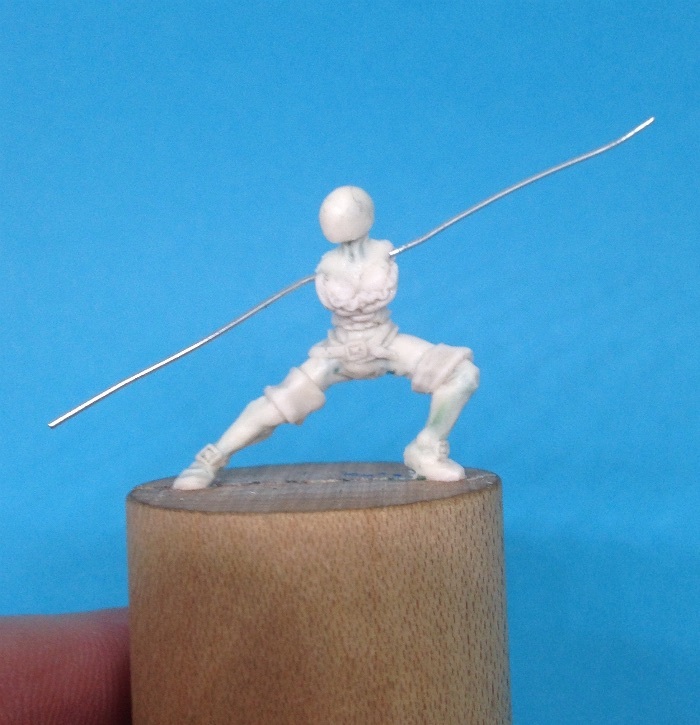 I based the mini on a 50mm Secret Weapon resin base that I built up to match the miniature. It was base coated with Vallejo Electric Blue. After that, I washed the mini with Imperial Blue. I’m generally a slow sculptor. I’m already one month behind my New Years resolution and its only March! Additionally I’m always trying to learn and improve so lately I’ve been watching an awesome YouTube channel by Tom Mason. He sculpts in Fimo mostly and while I like my ProCreate putty mix I felt I need to try his technique especially since we have asked him to do videos about putty sculpting. If I’m asking him to step outside his comfort zone, I think I should be willing to do the same. 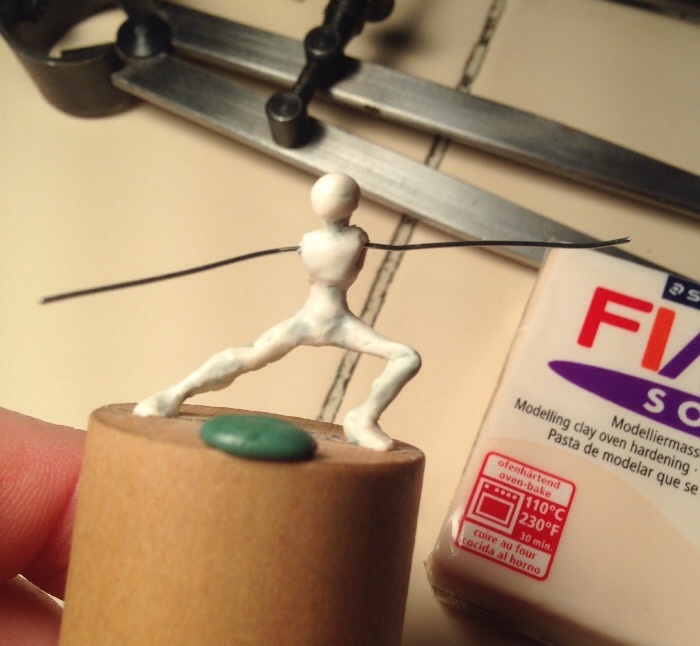 So, here is my initial attempt in the world of Fimo sculpting. 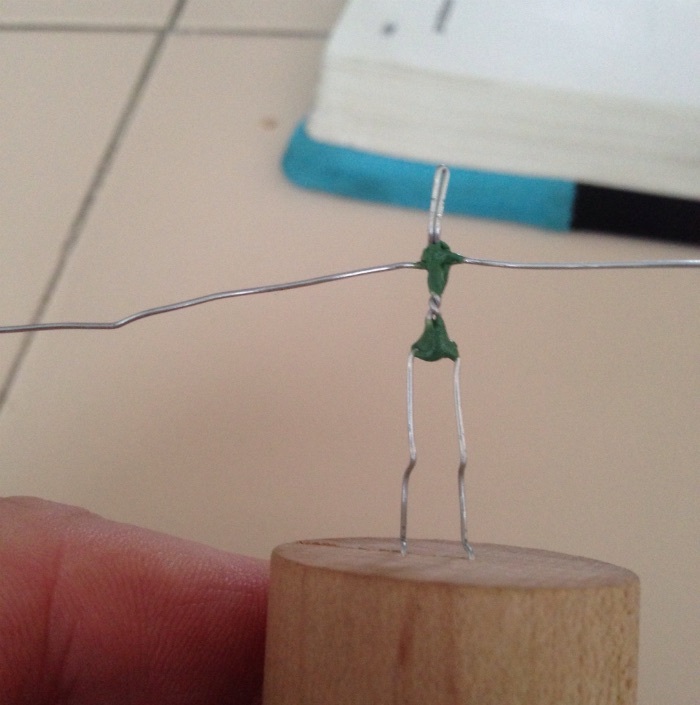 As always, the sculpt starts with an armature. It is made with 24 gauge steel wire and held together with greenstuff. I let this cure. 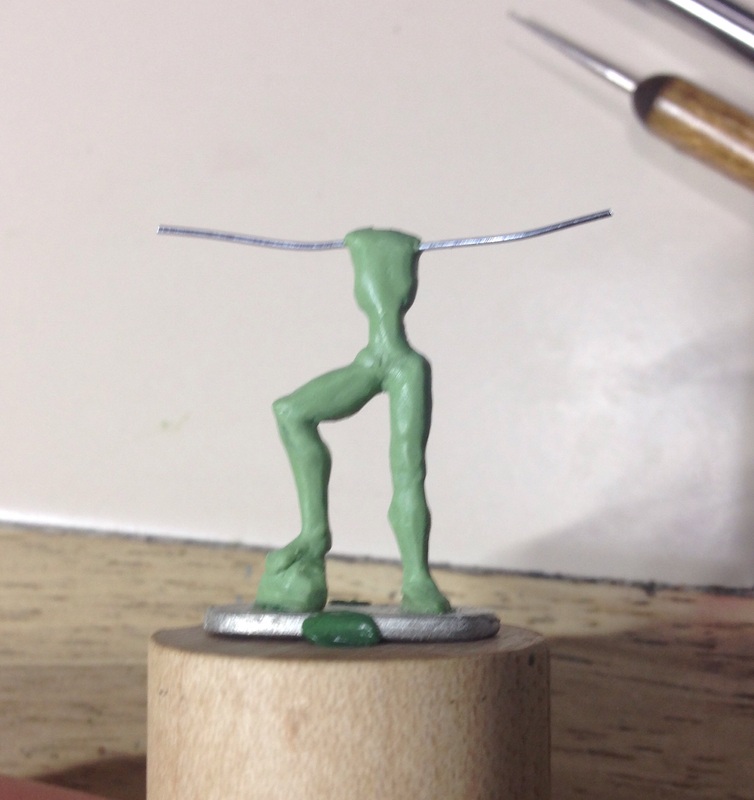 Probably didn’t need to do this, as it just bulked out the armature, but that is what I did. The next step is to cover the whole armature with a thin skin of greenstuff and then immediately cover that with the Fimo. These layers should be thorough but thin. This is then allowed to cure. The greenstuff will cure but the Fimo remains soft. Once the armature is covered, sculpting can begin. 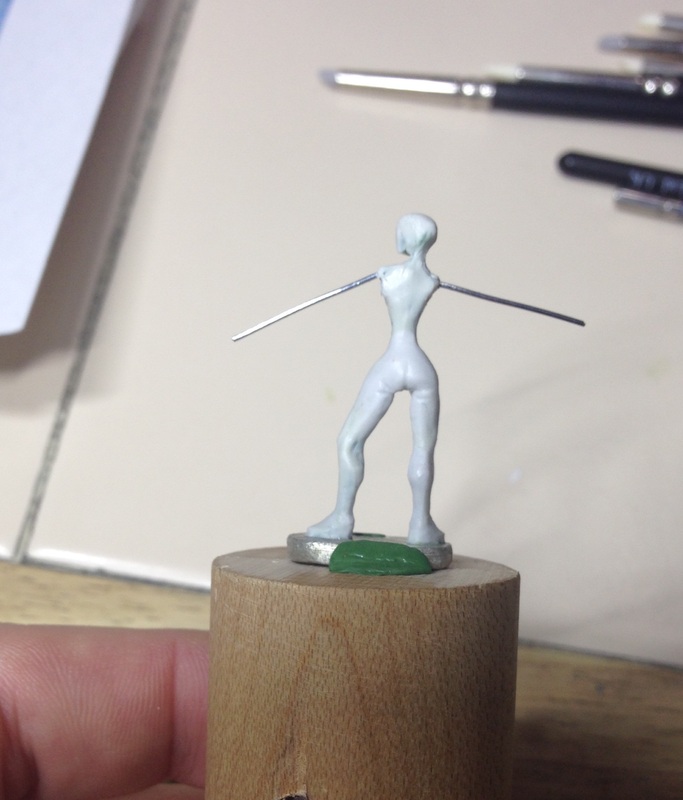 I started by bulking out the miniature. 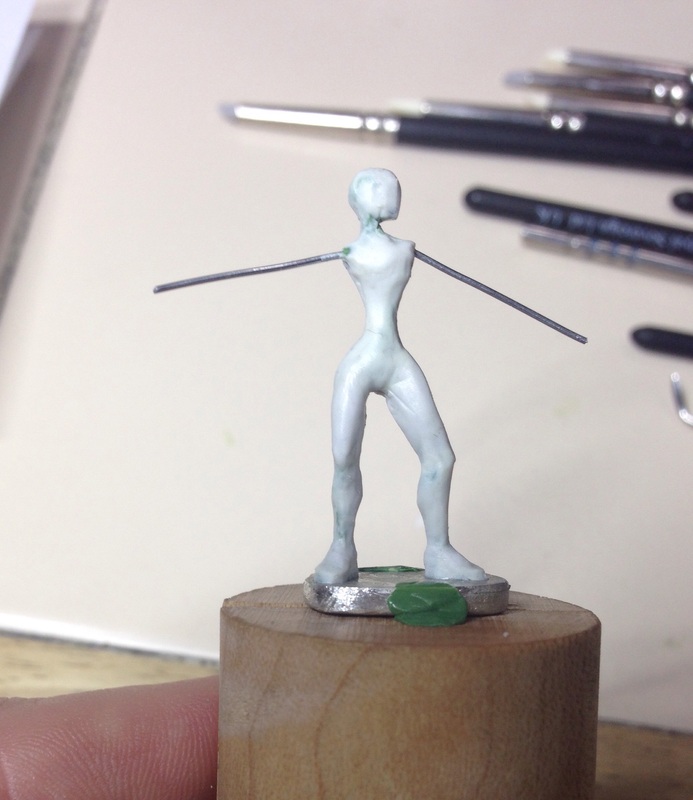 Once bulked up a little, the actual sculpting begins. That’s where I’m at at this moment. So far I like this media. It seems to work faster as there is no down time for curing. Also, I’m able to revisit areas several times and still modify them. 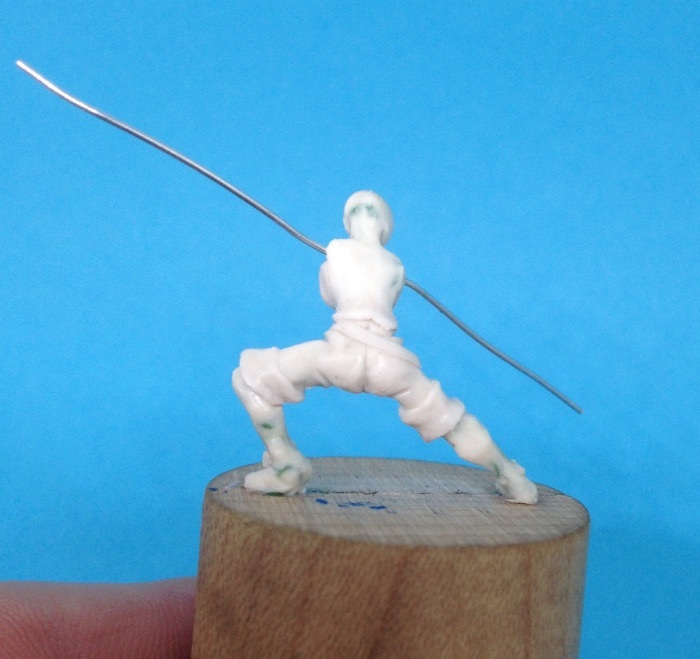 Also it forces me to look at the sculpt as a whole and not just an arm or a leg. I’m not quite sure as to how I’m going to cook this and eventually vulcanize it into a mold but I’ll face that when I get there. If you’re interested in sculpting, I highly recommend the videos on Tom’s YouTube channel. If you enjoy them, you can also support him via Patreon.